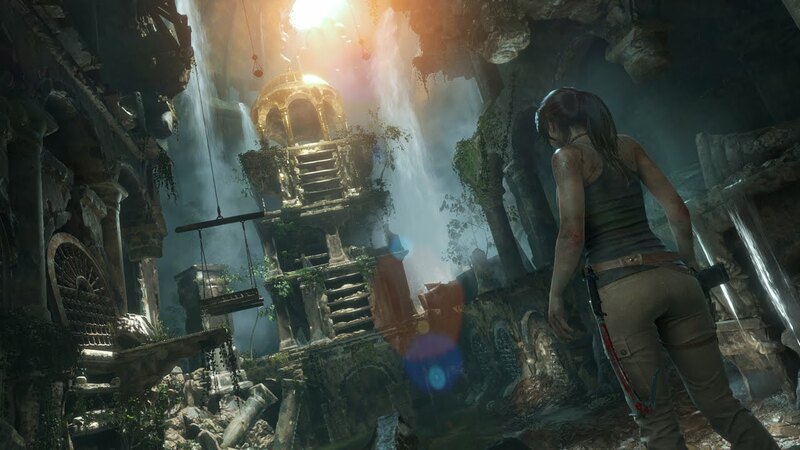 I wrote a review of Rise of the Tomb Raider for Tap-Repeatedly.com. In the process, I went back and read my Uncharted review. I played Uncharted really late, and I actually didn’t much like the first Uncharted when I played it. On the other hand, I liked the Tomb Raider reboot and its sequel quite a bit. This is despite the fact that, as I mention in my review, they use more or less the same game format as the first Uncharted. So what’s different? I spend a quick paragraph on it in the review but I want to examine in a more rambling fashion this idea of environmental affordance. I think it’s an important component of modern game environment design. I’m one of the rare gamers that has written some stuff critical of Final Fantasy VII. Just this week I read this article about the remake trailers, written by Brendan Keogh . I think it’s interesting that he talks about how FFVII “leans into its technical limitations” because I’ve always found the art direction in FFVII uneven for this very reason. Sometimes the environments were so high fidelity in dungeons compared to my weird little block character that it wasn’t even clear where I was able to walk. Fortunately, the designers of the game knew this, and allowed an optional waypoint graphic to appear when needed. This was a trend-setter for many years to come. In the modern days, we have “Detective Mode.” This is most famous from the Rocksteady Batman games, and in the first game, Arkham Asylum, it’s so useful that it’s basically pointless to even turn it off. 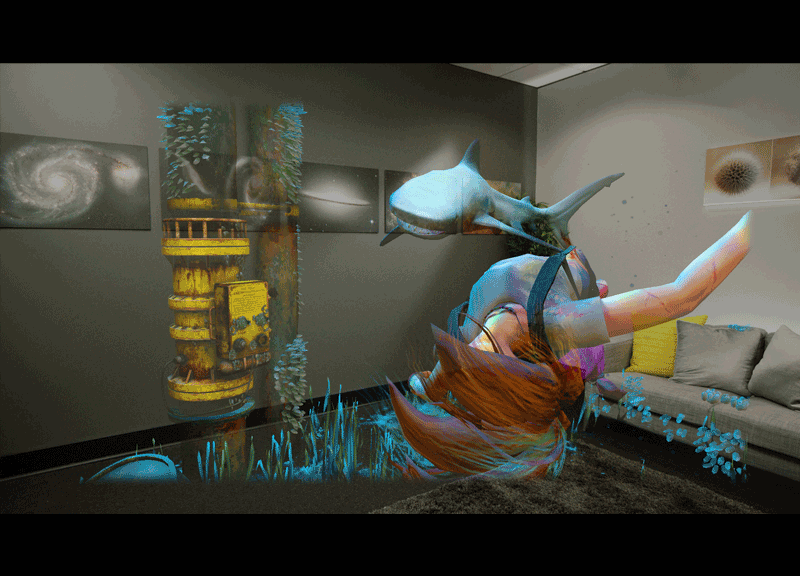 Tomb Raider has a similar vision mode called Survival Instincts. It’s balanced by the fact that the player can’t leave it on while in motion and it only flickers up for a brief time. That is, unless you disagree that it is balanced at all. I’ve seen some people such as Andrew Reiner here write that the mode makes the game a bit too easy. 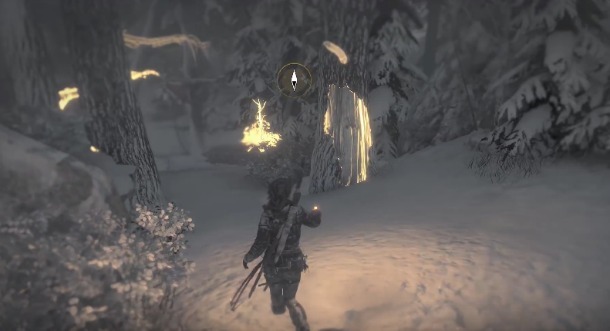 Tomb Raider/Rise of the Tomb Raider do another thing that’s good, though, and make objects in the environment that can be interacted with very similar in appearance. Any tree in Rise of the Tomb Raider that I can climb looks like every other climbable tree, with a flat bit of exposed wood under the bark and some obviously stripped branches. Rock walls suitable for using the climbing axe all have the same pocky-looking bump map. And most ledges Lara can hang from have a slight white highlight on the top edge, usually a streak of paint, though sometimes it’s just a patch of snow or a trick of the light. This may not be realistic, but I don’t care. It’s a price I’m willing to pay for it being really obvious what I can and can’t interact with in the environment. This part of the game’s texturing is consistent enough that I rarely needed the Survival Instincts to figure out a traversal path, though it was useful occasionally, especially if the way forward wasn’t immediately clear. Consistent assets help out with affordances as well. 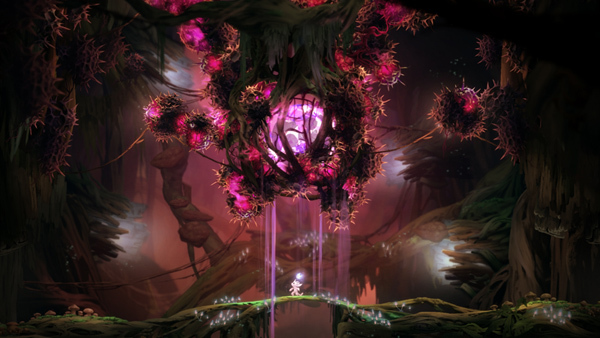 There are a few traversal methods later in the game that require objects. If there’s a place I can axe-grapple and swing, the hook that I need to hang from always looks very distinct. 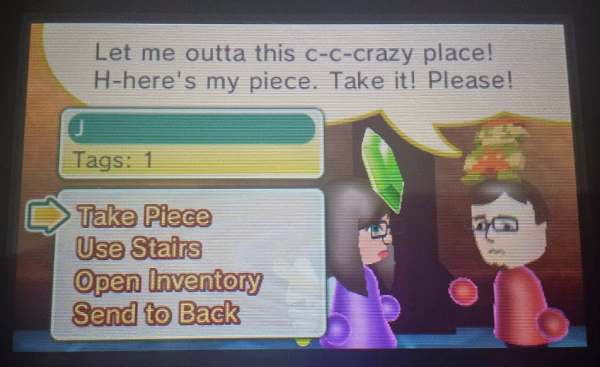 The weights and cranks used for puzzle solving are always similar-looking assets as well. This is probably convenient for the developers in that they can re-use the same environment assets from time to time, but it’s also incredibly useful for gamers in that an axe crank always looks like an axe crank. This way I can get to figuring out how to solve the puzzle, instead of just milling around trying to figure out which part of the puzzle is the interactive part. These two factors combined make me wonder how the game would play without the Survival Instinct vision. But overall I found the vision mode just too useful to live without, especially when finding collectables or enemies in the environment. 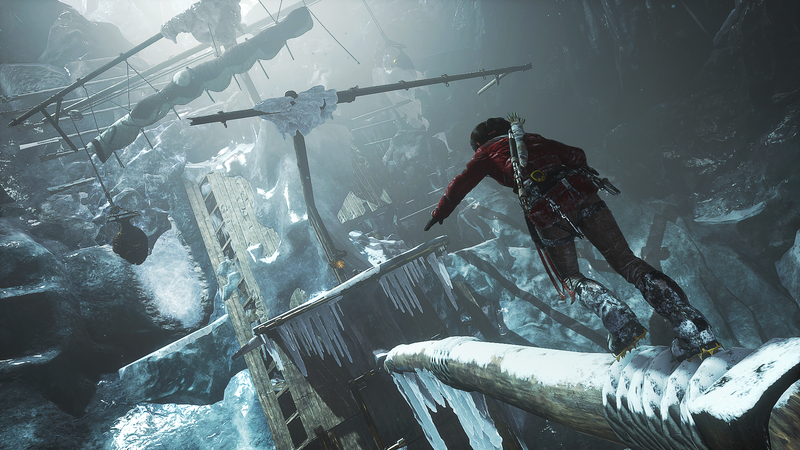 I think overall, Rise of the Tomb Raider would be a terrific game to study for a basic primer in how to make environments read clearly even when they’re dense with information. This kind of stuff means the difference between a game I enjoy, versus a game that makes me want to tear my hair out in frustration. We’re getting to the end of my Mortal Kombat character list, and here I’ll cover all the characters I missed in previous installments! This one is kind of picture-heavy since I talk a bit more about visual choices, so keep that in mind when you click the link. 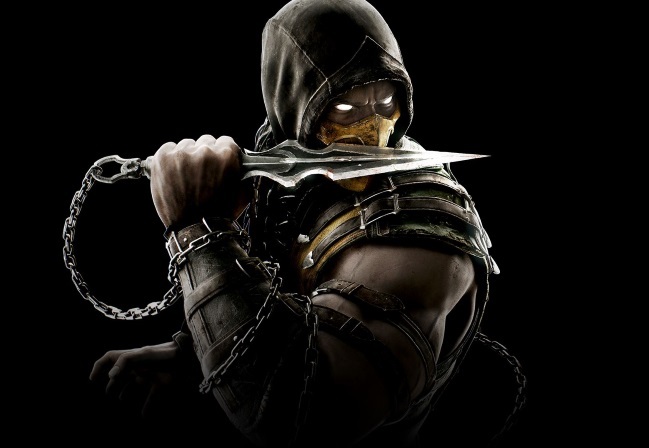 This article discussing ninjas in Mortal Kombat will contain some mild spoilers as pertains to ninjas in the story of Mortal Kombat. But before I even talk about ninjas, I’m going to talk about Kenshi! 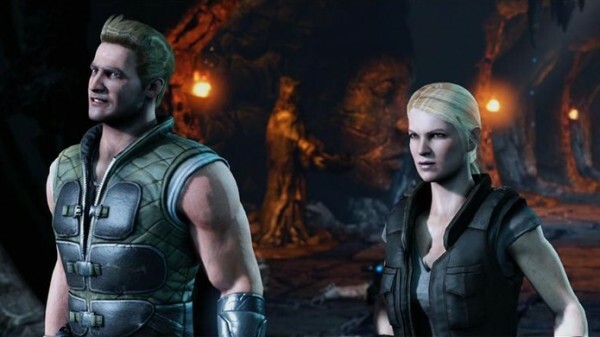 By request, I’m going to start by talking about Cassie Cage. Below the jump! I was already interested in trying Mortal Kombat X, because it had been a little while since I bought a Mortal Kombat game. I was pushed over into the “immediate purchase” category by a tweet from Javy Gwaltney saying he’d like to see what a woman thought of the game. Specifically, he was asking about the changes in outfits, but I thought I’d go ahead and write a bit about the game in general. That turned in to wanting to write a lot about the game in general, so this is the first post of a bunch. As a woman, I am also a person who really likes Mortal Kombat. I would go so far as to call myself a fan, though I haven’t bought every single installment. I played MK a lot back in the old controversy days of the 90s. I like to think I was pretty good at it, as a kid. In the arcade, I didn’t have to be better at fighting games than the rest of the world. I just had to be better than whoever had the next quarter to put up. The thrill of seeing someone’s head eaten in a Fatality, even if I didn’t perform it myself, was more than worth the 50-cent price of admission. We bought the Sega Genesis when we did partially because it had the “real” Mortal Kombat port, with the actual blood. You still had to enter a code to get it (ABACABB, and no, I didn’t have to look it up). In the years that followed I went to see both films (yeah even the really terrible second one) and continued to track the series’ insane, pulpy story. I’ve purchased installments of the home game off and on over the last few years. I’ll break my “review” into a few parts, starting with an overview of characters. I have no idea how long this is going to ramble on for, so I’m using my own blog for it. Also, except for saving my absolute favorites for the end, I’ll discuss the characters in no particular order! 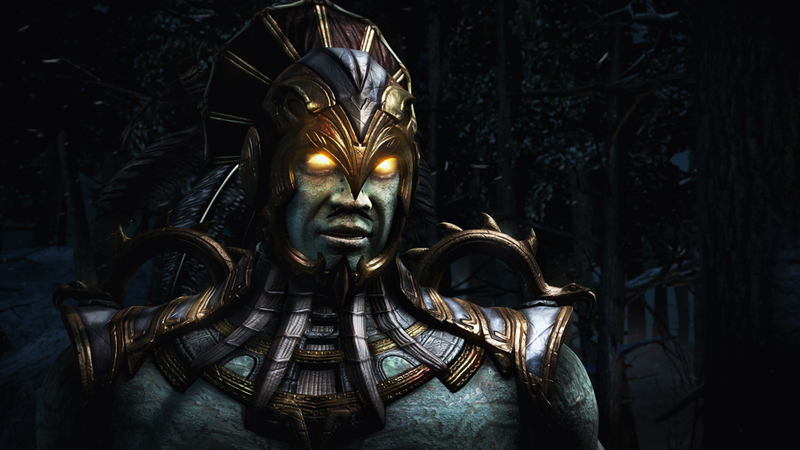 So, starting tomorrow and ending Whenever: A Review of the Characters (and guest stars) in Mortal Kombat X. For today, here’s the “We Hate Movies” podcast picking fun of the movie. You’re welcome. 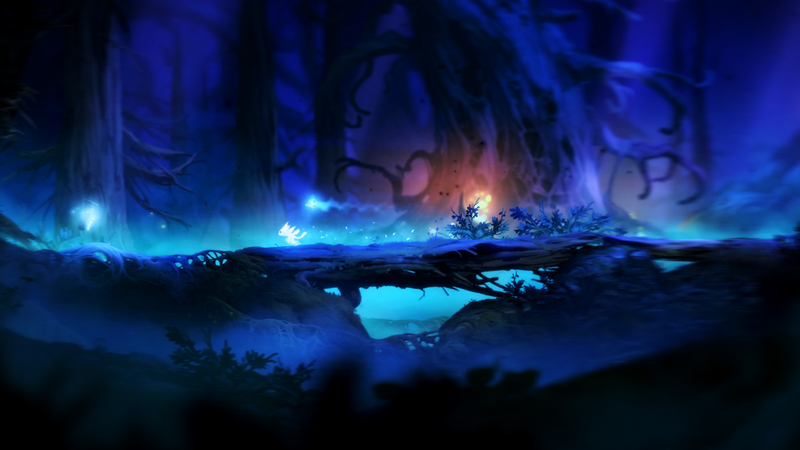 I had a weekend set aside to relax, so I spent some of it playing Ori and the Blind Forest on Xbox One. I first saw the game at the ID@Xbox showcase at GDC, and then it was available just a few days later, so I took the plunge. It’s super pretty but super hard, like Super Metroid mashed up with Super Meat Boy … and then rolled in a Miyazaki film (I ran out of ‘supers’). I’m just past the 50 percent mark, and I’ve died over 200 times. Which is probably lousy! I just changed my Twitter background to this just because it’s so soothing. It felt a little weird to have Mario and not a Microsoft game in that background (even though I still love Mario). 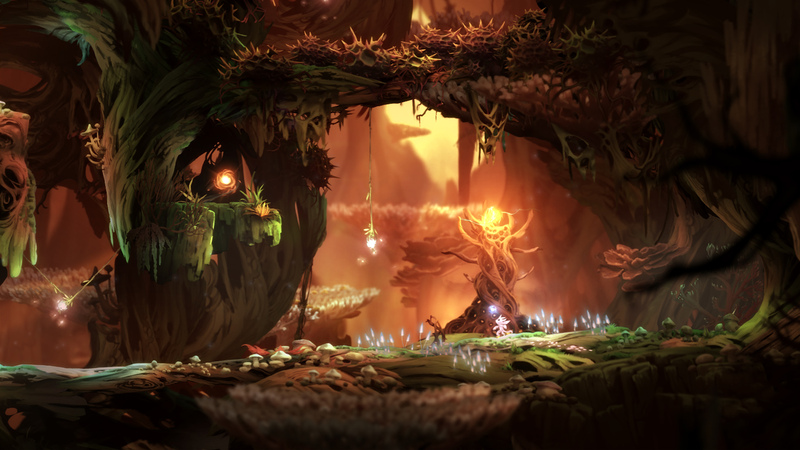 The big trends in indie gaming this year so far seem to be Metroidvanias in the single player, and 4 or 8-player local arena games for the multiplayer. Towerfall and Sportsfriends are the trendsetters here. At GDC I also spent some time with ClusterPuck 99, which I’ve written about at Tap-Repeatedly after a good chat with the developers. I feel like I’m forgetting some, and here it’s only March. 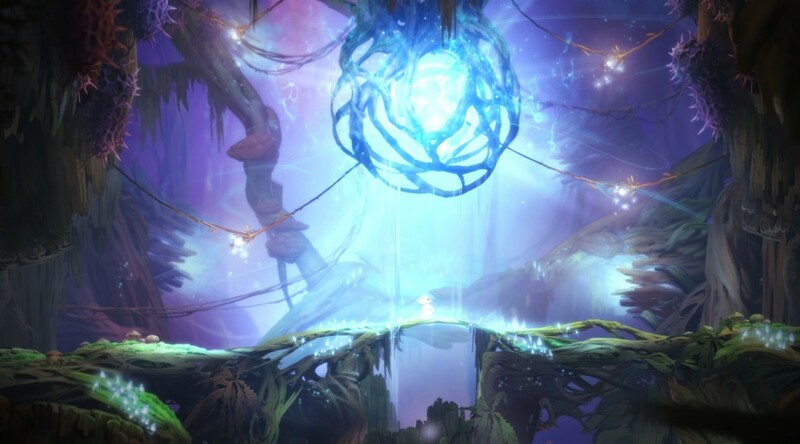 Feel free to talk about how “metroidvania” is a bad name for a genre – I am not 100% on it, but it seems to be what everyone’s settling on for now. At MAGfest I was lucky enough to be on several panels as part of the MAGES wing of the conference! You can see the panel I headed up about Game Critique and Reviews, here now on this video on YouTube! Joining me are Chris Totten, Luke Peterschmidt, and Bobby Schweizer. It’s hard to see the slides (which are a bit text-heavy), but you can check them out on my OneDrive or on SlideShare. To be honest, I’ve wanted to cover this topic in my blog for literally years. I’ve had an item sitting in my draft folder since August of 2012 asking “what is the value in game critique”? The problem was I never came to any real conclusion about it that worked well as an essay. So I boiled my feelings down into this panel talk instead and invited many to take part. There’s a lot of great questions, discussion, and diverse opinions. I know the panel videos are long (and yeah the concert vids on MAGFest may be way more interesting to most people) but I hope a few people will check it out and get something out of it! The info in this panel is already out of date – as I was making the slides, Joystiq decided to stop using review scores, but now, just like that, Joystiq as we knew it has come to an end. Today, however, Eurogamer has announced they’re dropping review scores, so the debate continues. I’m in favor of this method, but curious what other people think! If you want to see more about how I personally review a game, you can read my latest, too: Hyrule Warriors. I’d like to thank MAGES for inviting me, and everyone who took part in this amazing discussion! This is my conclusion of a three-part exploration of the different games that tied to 3DS Streetpass. Part One here; Part Two here. This looks at one last game, then talks about some conclusions I’ve drawn. Monster Manor is the most complex of the games, so it has the longest entry.